Squash House Quilts: What Was I Thinking? Don’t forget - comments on any of my posts this week through midnight Saturday will be entered in my Birthday Anniversary Giveaway! A couple of you that have commented have left me no way to get it touch if you win, so please make sure I have an email address if you don’t have a blog! Stephanie had a terrific post about this yesterday - thanks, Stephanie! Also, thanks to all of you who knew who designed the fabric I posted about yesterday! The designer is Michelle Engel Bencsko and you can visit her blog Cicada Daydream here! I've already ordered some fabric and it's on its way! A while back I posted about how I began my quilting journey. As I continue cleaning out my 56-Drawer chest, I find more little reminders of that beginning! Here is what is in drawer #1 (and 2 and 3). This is a photo of a color photocopy so it will be somewhat fuzzy and the background is not at all blue, rather a soft purple. It's called Vintage Dreams and was designed by Jean Wells. This is some of the fabric from the first month which gives you a better idea of the colors. The second Sew Expo I went to I saw this quilt made up in the Stichin’ Post booth from Sisters, Oregon. 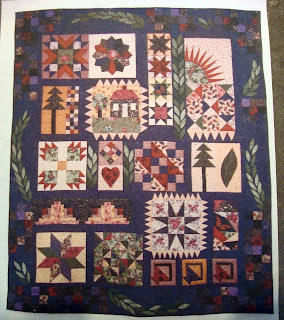 I was still a beginning quilter at that point, but something just drew me to this quilt and I had to get the pattern! Well, it turned out to be a block of the month program - something I had not yet heard of. Happily, I signed up anyway. When the first month arrived, I realized I may have bitten off more than I could chew! The instructions were way more complicated than I could have imagined and there were all of these tiny pieces of material. So I stuffed the first month in drawer #1 and eventually filled up three drawers with the entire 12 months and it has been there ever since! Now many years later I look at the instructions and fabrics and understand them completely! It will be fun to make and although the colors in my bedroom have changed dramatically since then, I’m sure I can find a place for it at the Squash House! That is going to be so beautiful! I know what you mean about understanding directions. I was looking at some old quilt magazines over the weekend and noticed that some patterns that I deemed too difficult when I got the magazine seem easier now and not so scary! It's going to be a beautiful quilt! Although I've been quilting for over 15 years I still look at some projects and get the shivers! Whoa, yes that pattern would have been very scary to start when I was a beginner. I have lots of quilts that don't match my decor. I just love making them. Thanks for coming by my blog. That pattern, and especially those fabrics, are beautimous! How fun that it's something that you were attracted to you at the beginning of your quilting journey and now you are ready to master it. It's going to be gorgeous. What a lovely quilt! Are you going to start on it soon! Love, love, love the quilting chest and your little reveals! The quilt looks like a lovely challenge.....I hope you enjoy the process. I have been enjoying your blog and will look forward to your progress. Happy Happy Birthday..hopeyou have sewwonderful a day!! Ya know, I think I have some of that purple fabric in my stash. It always makes me laugh when I see fabric I own on someone else quilt of blog! Have fun! Thinking of you and hoping that you a still enjoying your birthday. Happy Birthday!!! So nice to find your blog through Carrie!